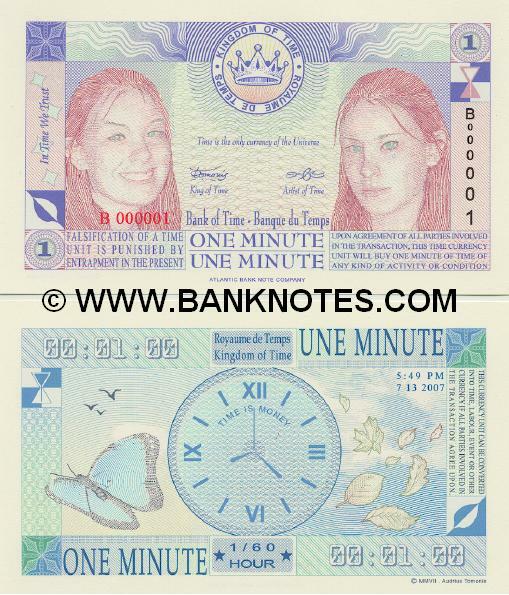 Kingdom of Time 1 Minute 2007 - Time Currency Notes, Paper Money, World Currency, Banknotes, Banknote, Bank-Notes, Coins & Currency. Currency Collector. Pictures of Money, Photos of Bank Notes, Currency Images, Currencies of the World. Front: Smiling woman - (mood changes in a minute) - Crying woman. Back: Butterfly; birds; clock; falling leaves. in the pricelist or this may be a gallery item (usually not available for sale). A. Micro-Text: Very small letters, sometimes as single lines, or in multiple repeating lines forming a larger block in the underprint design. B. Optical Registration Pattern: A design technique where half of the image in a framed area is printed on the face, and the other half is printed on the back, in exact register, so when held to a light, the two half images form one full image. C. Guilloche Pattern: An ornamental pattern formed of two or more curved bands that interlace to repeat a circular design, most commonly seen on banknotes. D. Serial Number: A unique number given to each banknote (note, bill) for identification. Copyright © 1998-2007 Banknotes.com All rights reserved.